After my last post, I couldn't stop thinking about my big pine farm table. When I bought it 15 years ago I didn't realize how huge it was and it's never had a home. For the last year it's been in the shed, isn't that sad? Sooooooo.... I'm going to make my living room into a formal dining room! It's become the reno storage area (lovely first impression), and I'd like to use it and be able to have dinner parties. I loooove dinner parties. I had painted the room my favorite cream last year, so the first thing I did is put up curtains, and I did it all with things I had on hand. The rods and sheers I bought at IKEA 2 years ago and hadn't put up. The linen panels (from Wal-Mart) were leftover from the old house. I sewed the panels together to make them big enough and up they went. I also moved the big table into the middle of the room. Unfortunately it is currently holding all the stuff for the endless bathroom reno, so I can't show it..... yet! I also moved my chandelier from the kitchen dining area into the middle of the room. It was too big for the kitchen and made it feel crowded, but it's perfect in here. Gootz put a plug on it so I could swag it over to a plug. I'm also particularly proud of myself for making a cord cover for it out of another of those old linen curtains. 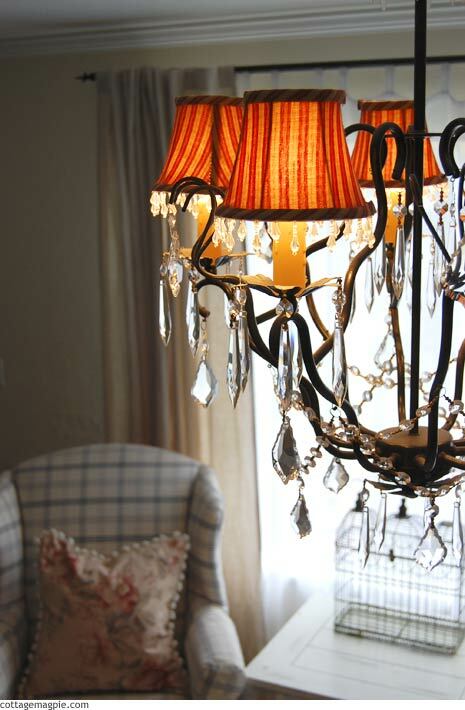 I really want some new shades for the chandelier, something fresh and cottage-y. Maybe yellow or green. Would green make people look sickly at the dinner table? I also have to relocate our book collection. I don't know where, but the books are just so dark and heavy, and I'm picturing a pretty, light china cabinet on this wall. I'm not sure where the books will end up, but I'm sure I'll figure out something. I'm really feeling motivated with my new project. More soon!